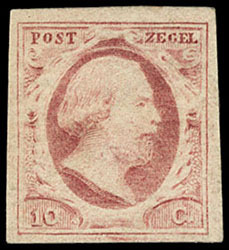 Netherlands, 1852, First Issue, 10c lake, full o.g., small hinge remnant, ample to large margins, strong bright color, Very Fine and choice. NVPH No. 2. Netherlands, 1852, First Issue, 10c lake, three singles, each with full margins and deep color, tied by "Zutphen, 19/12" cds's on 1858 folded letter sheet to Bordeaux, France, matching "P.D." handstamp and red Paris transit, receiving backstamp, Very Fine. NVPH No. 2. 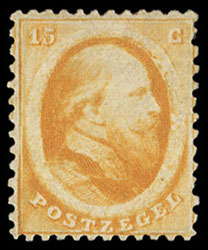 Netherlands, 1864, King William III, 15c orange, full o.g., well centered for this tight margin issue, rich radiant color, Very Fine and choice, a scarce mint stamp. NVPH No. 6. Netherlands West Indies, 1889, 30c pearl gray, block of 4, light town cancels, bright strong color, strong intact perfs, Very Fine, a choice and very scarce used multiple. Scott No. 11 $210 for singles. 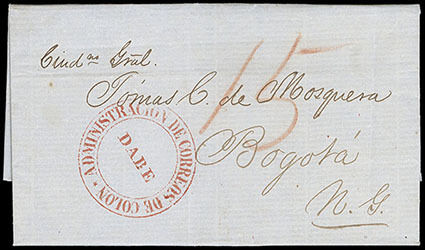 Panama, Administracion De Correos de Colon, Dabe, sharp bold strike of red circular handstamp on folded letter datelined "New York, April 20, 1858" to General Mosquera in Bogota, New Granada (Colombia), red crayon 15 centavos rate for single weight letter, Extremely Fine and choice, this being one of five recorded examples of the "Dabe" for "Debe" error debit handstamp. Panama, Colombia 1892, Registration, 10c yellow brown on light buff, blue "926" handstamp, used with Panama 1892-96, 10c orange, two pairs, and 20c violet, two singles, cancelled by two strikes of "Panama, 22 Feb 1895" duplex on legal-size blue Mallet correspondence cover to London, England, New York (3.5, 3.6) oval backstamps and New York registry exchange label affixed, partial London (3.13) arrival datestamp; cover opening tear, F.-V.F. Scott No. Colombia F12 + Panama 18, 19 Estimate $750 - 1,000. 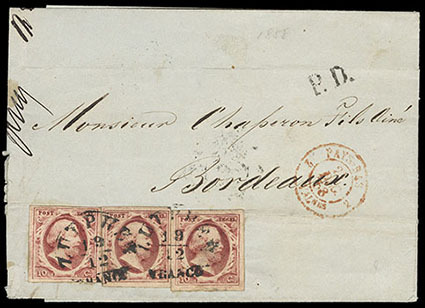 THIS IS THE SECOND HIGHEST FRANKED 19TH CENTURY PANAMA COVER RECORDED. 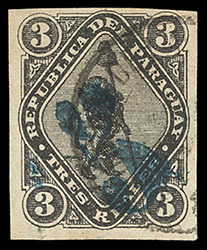 Paraguay, 1878, 5c on 3r black, blue surcharge, neat town cancel, ample to large margins, Very Fine. 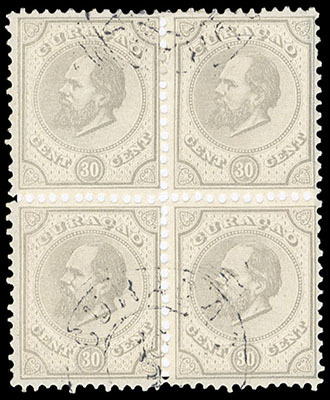 Paraguay, 1881 Lion issue, plate proofs, imperf proof sheets of 100 on thick carton paper; 1c in brown and black, 2c in rose and brown and 4c in blue and brown, also sheets of unissued 2r in brown and green, issued sheets with "Litho. L. Gourmand. Buenos Aires" imprints at sides; minor selvage flaws, otherwise Very Fine (no photo). Paraguay, 1881 Lion issue, plate proofs, imperf proof sheets of 100 on wove; 1c in brown, black and rose, 2c and 4c in blue and black, with "Litho. L. Gourmand. Buenos Aires" imprints at sides; minor selvage flaws, otherwise Very Fine (no photo). 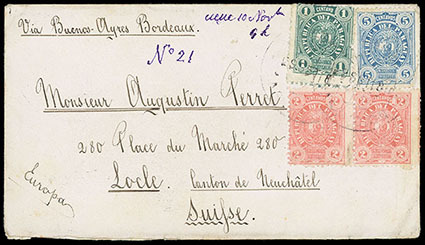 Paraguay, Asuncion to Switzerland Correspondence, 1885-1903, of 24 covers and early stationery; including uprated stationery, registered, 1884 issue on several covers, etc., generally F.-V.F. 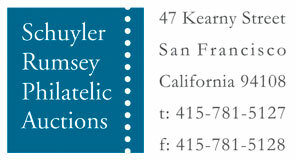 or better, scarce commercial mail.